Samsung Stratosphere: Previously rumored as Verizon's version of the Samsung Galaxy S2, the Stratosphere is listed as a "4G Smartphone w/Android 2.3." While it isn't exactly confirmation, there is a chance that this rumor was spot-on. Prepare for its release on September 8. Droid Bionic: Months after its original unveiling, the Droid Bionic is finally going to be available to purchase. And, just like previously reported, it will be launched on September 8. Motorola Xoom: The third Android release for Verizon on September 8. Now, you may be thinking - hasn't the Xoom already launched? Well, its upgrade to 4G compatibility is finally going to arrive. Older Xooms will have to go through the upgrade process, while all Xoom tablets purchased after this date will already be 4G compatible. Samsung Illusion: Not much is known about this Samsung device, except that it will run Android 2.3 and will not be 4G capable. Look for more info once we near its September 29 release date. 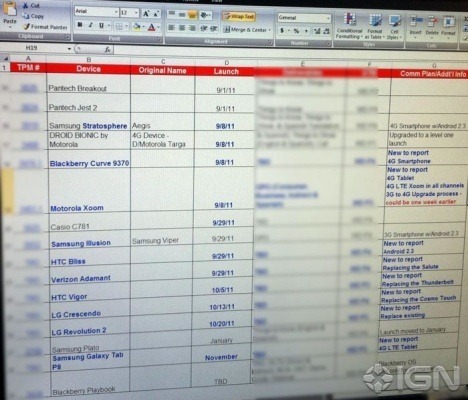 HTC Bliss: Another September 29 Android release will be the female-friendly HTC Bliss, running Android 2.3. Based on the target audience, it probably won't blow anyone away in the specs department, but only time will tell. HTC Vigor: Here's where things get really interesting. The Vigor, set for release on October 5, is listed as "Replacing the Thunderbolt." No word on how exactly it will do so (though dual cores are a safe bet), but we'll probably be hearing a lot more about this device as it nears release. LG Revolution 2: The LG Revolution isn't exactly an old device, but in just 2 and a half months (on October 20) it is set to a see an update. Again, not much detail here. Samsung Galaxy Tab P8: Set for release sometime in November, this 4G LTE tablet seems awfully familiar; after all, the Galaxy Tab 10.1 is already on Verizon. Possibly the Galaxy Tab 8.9? The first round of these devices is fast approaching, so expect a lot more details straight from Verizon in the coming weeks, depending on the authenticity of this document, of course.